– This is something new that I want to experiment with. Basically, what I’m going to do is take a marquee match-up in the upcoming week and look at it from a historical point of view. With that being said, let’s get this thing started with my first installment. This coming Saturday the Auburn Tigers square off against the South Carolina Gamecocks with the SEC Championship on the line. If Auburn wins, they will play in their first BCS Title Game. The last Auburn team to win the SEC was the 2004 Tigers squad, a team that many pundits still claim should have been in that year’s BCS Championship Game. 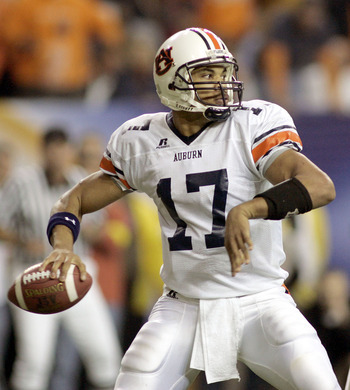 Let’s throw it back…..
Every Auburn fan wants to compare this year’s Auburn team to the undefeated one in 2004. The 04 team was a juggernaut. They were number one in scoring defense and 18th in offense. Four Auburn players were first round NFL Draft picks in the 2005 NFL Draft. Three of them were on the offensive side of the ball; RB Ronnie Brown (#2), RB Cadillac Williams (#5) and QB Jason Campbell (#25). Brown and Williams combined to run for 2,078 yards and 20 touchdowns. Campbell threw for 2,700 yards and 20 touchdowns. Three other offensive starters were selected in the 2006 NFL Draft. These include OT Marcus McNeil (2nd Round), WR Ben Obamanu (7th Round) and WR Devin Aromashodu (7th Round). G Ben Grubbs was a 2007 NFL First Round pick. Even with all the talent on the offensive side of the ball, the staple of the team was the defense. Eight of the 11 starters would go on to play in the NFL. 2005 First Round NFL draftee (#9 overall) CB Carlos Rogers took away half the field. He was a phenomenal cover corner. DT Jay Ratliff was a force in the middle and would go on to make the Pro-Bowl with the Cowboys in the NFL. All season long, the Tigers had to prove the voters wrong as they steadily climbed up the polls week after week. The SEC Championship Game was their last chance to make a statement before the final BCS Standings would be unveiled. Auburn (11-0) ranked third behind No. 2 Oklahoma and No. 1 USC. Auburn’s opponent in the SEC Championship was the Tennessee (9-2), ranked 15th in the country. The Volunteers went 7-1 en route to winning the SEC East. Jason Campbell had a fantastic game as he threw for over 300-yards for the first time in his career as Auburn won 38-28. Campbell, the MVP of the contest, went 27/35 for 374 yards and three touchdowns. Those three touchdowns went to three different receivers. The Tigers made a statement on the first play of the game as Jason Campbell hit Courtney Taylor for a 56-yard pass play. Auburn capped off the opening drive with a touchdown as Cole Bennett recovered a Cadillac Williams fumble in the end zone. After a quick three-and-out from Tennessee, Auburn would strike with another touchdown drive. Williams would hold on to the ball this time rushing for a 5-yard touchdown off the left side. At the 8:28 mark in the first quarter, Auburn took a quick 14-0 advantage. Auburn took a 21-7 halftime lead. Tennesse showed some life coming out of the locker room for the second-half. They scored on their first two possessions to start the third quarter to tie the game at 21. Calmly and coolly, Auburn would respond with a 53-yard touchdown pass as Jason Campbell connected with Devin Aromashodu. The Tigers tacked on a field goal early in the fourth quarter to put them back up by ten. The final Auburn blow came at the 6:56 mark as Campbell threw his third touchdown as he hit Ben Obamanu for a 43-yard strike. The final score, 38-28, wasn’t indicative of how much Auburn controlled the game. Auburn dominated Tennessee in all aspects; possession 39:31-20:29, total yards 559-297, first downs 31-9 and passing yards 374-69. Over the last couple of years the argument has been made to get rid of the NCAA Preseason Poll. Looking back at the 2004 season, USC and Oklahoma started the season No. one and two, and finished the regular season the same way. Auburn started the season ranked 17th in the AP poll. I don’t think the problem is the preseason poll, it’s the perception. USC and Oklahoma came into the year as established programs consistently making BCS appearances. USC had two consecutive BCS wins under their belt as they beat Michigan in the 2004 Rose Bowl 28-14, and Iowa in the 2003 Orange Bowl 38-17. Oklahoma came onto the national scene in the 1999 season as they finished undefeated defeating Florida State 13-2 in the 2000 National Championship Game (Orange Bowl). They lost to LSU 21-14 in the 2004 National Championship Game (Sugar Bowl). It also didn’t hurt that they were bringing back the reigning Heisman Trophy winner in QB Jason White. Then Auburn head coach Tommy Tubberville did a great job of steadily building Auburn’s program, but they simply weren’t on the same level as USC and Oklahoma. Auburn defeated Wisconsin the previous year 28-14 in the Music City Bowl. Not exactly a BCS game. You could see why, if USC and Oklahoma finished undefeated, they were on a collision course to meet in the Title Game. Playoff anyone? Looking back now, it’s very easy to see why people think Auburn should’ve been in the Title Game instead of Oklahoma. USC throttled Oklahoma in the National Championship Game 55-19. Auburn settled for the Sugar Bowl, defeating ACC winner and No. 9 Virginia Tech 16-13. Auburn had a 16-0 lead heading into the fourth quarter. 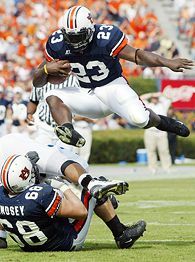 This year’s Auburn squad is not only playing for themselves, but also vindication for the 2004 team. With a win on Saturday, the Tigers will be well on their way to achieving their goal. It will be the second meeting of the season between Auburn and South Carolina. Auburn overcame a 14-point first half deficit to win the game nine weeks ago 35-27. While the 2004 team may actually be the better team, there’s no doubt that Cam Newton is the best overall player between both rosters. Controversial or not, his performance in the Iron Bowl solidified his Heisman Trophy. 25 years ago the Bears shuffled their way to a Super Bowl title. Boy have times changed for each franchise in that game.